Hi paper crafty friends! Today I'm sharing my Design Team card for Creative with Stamps # 30 Pumpkin. For the background I blended various colors of Distress Oxide inks, then spritzed water through a tree/branch stencil. The pumpkin is a bit of punch art made with 3 punched out ovals. I stamped each piece with a hardwood background stamp from Stampin Up! and glued them together. The leave stamps are from Stampendous. The sentiment is Stampin Up! There are so many things I like about this card. I love your stenciled DO background. It's gorgeous. 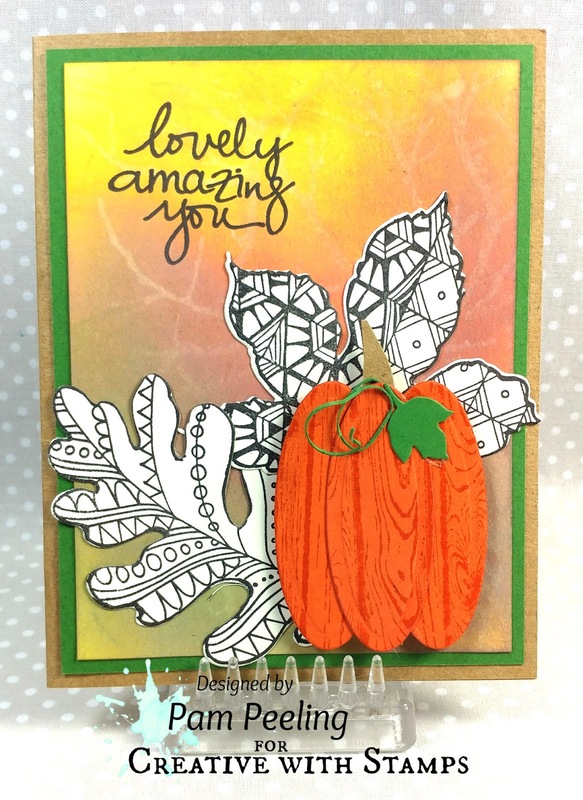 Love the woodgrain texture on the pumpkin and those wonderful black and white leaves look fabulous behind it. The sentiment is perfect with all of the other elements of this wonderful card.